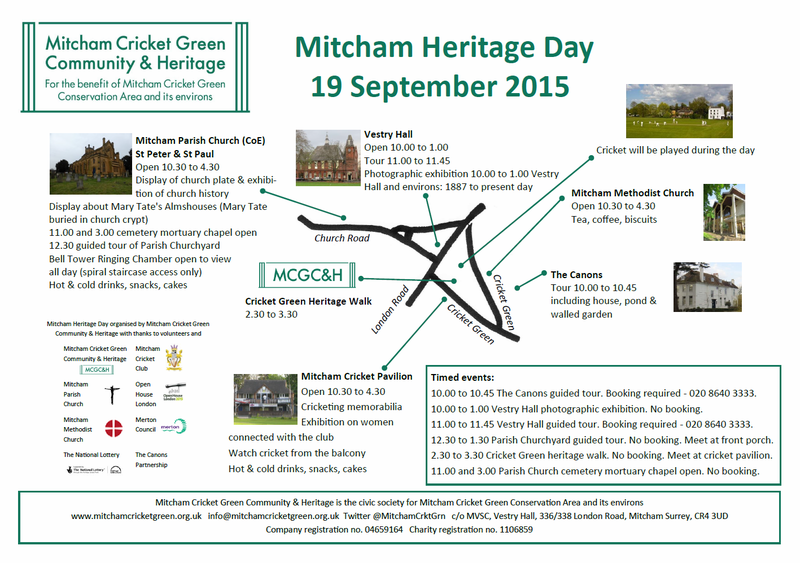 We are delighted to be organising Mitcham Heritage Day on 19th September 2015. You can enjoy a range of free walks, exhibitions, tours and visits to buildings and open spaces in and around Mitcham Cricket Green. Many of the buildings are not usually open to the public so it is a great opportunity to learn more about the area. Refreshments are available at many of the locations. 10.00 to 10.45 The Canons guided tour. Booking required – 020 8640 3333. 10.00 to 1.00 Vestry Hall photographic exhibition. No booking. 11.00 to 11.45 Vestry Hall guided tour. Booking required – 020 8640 3333. 12.30 to 1.30 Parish Churchyard guided tour. No booking. Meet at front porch. 2.30 to 3.30 Cricket Green heritage walk. No booking. Meet at cricket pavilion. 11.00 and 3.00 Parish Church cemetery mortuary chapel open. No booking. There are more details about the open buildings, walks and tours on our flyer. Download the Mitcham Heritage Day 19 September 2015 details as a PDF for high quality printing, or click the image below to see a larger version on screen. This entry was posted in Cricket Green Conservation Area on August 15, 2015 by mitchamcricketgreen.